On Common Ground cast members from left to right: Muhammad Usman Khan, Zainab Hasan, Imran Iftikhar, Haseeb Chishti, Fizza Hasan, Amna Mawaz, and Rabia Pasha. In the wake of the deadly school shooting in Florida many parents are left wondering how to explain and address horrific acts violence to their children. Can theatre help communities reclaim public spaces such as museums, movie theaters, concert venues, and schools? Theatre Wallay says yes. On Common Ground is a devised theatre piece that explores how communities reclaim public places which have been targeted as venues for terror. 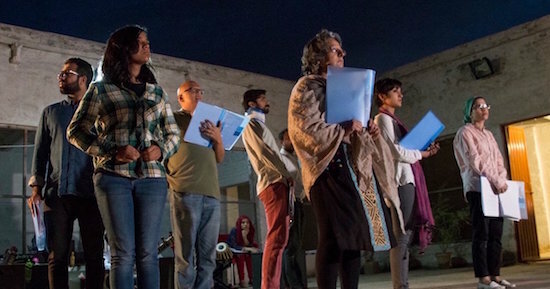 At a time of heightened political, social, and religious sensitivity and growing intolerance to diversity all over the world, Theatre Wallay is using theatre to address the disappearance of public cultural spaces due to extremism. 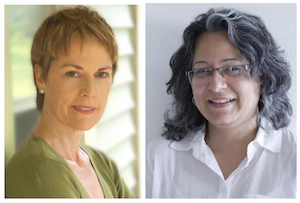 Executive Producer, Kathleen Mulligan (left) and Theatre Wallay Artistic Director, Fizza Hasan (right). On Common Ground is largely a women-led project. Executive Producer Kathleen Mulligan and Producer Linda Alper, both American Fulbright scholars, created the piece in collaboration with Theatre Wallay, a repertory company helmed by Artistic Director Fizza Hasan. The piece was directed by David Studwell and featured eight Theatre Wallay actors/writers, two Pakistani musicians, a dancer and a stage manager. Initial writing sessions and loose rehearsals began in Islamabad in September of 2016. Then in the summer of 2017, Theatre Wallay traveled to Oregon and performed On Common Ground at Artists Repertory Theatre in Portland, Oregon and again on the Green Show stage at the Oregon Shakespeare Festival. In the fall of 2017 Theatre Wallay artists traveled back to the US to present a workshop at Ithaca College. The entire project was made possible by a grant from the US Embassy in Islamabad. On Common Ground has come full circle and has been translated into Urdu for Pakistani audiences. Zard Paton Ka Ban (On Common Ground) is now touring theaters and schools in Islamabad, Lahore, Karachi and Peshawar, combining performances with educational workshops that encourage students to explore the public space theme through writing as well as participatory exercises. The culmination of the project will be a script writing competition for young people, organized by Theatre Wallay. The winning script will be developed and workshopped with Theatre Wallay artists. Learn more about Theatre Wallay’s On Common Ground by visiting their FACEBOOK page or WEBSITE. 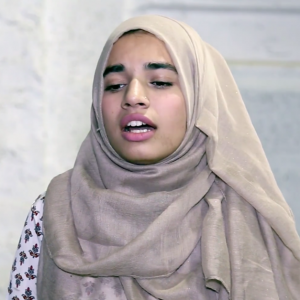 This entry was posted in Arts & Social Justice, Theatre, Video Included in the Post and tagged Artists Repertory Theatre, Fizza Hasan, Ithaca College, Kathleen Mulligan, Linda Alper, Oregon Shakespeare Festival, Pakistan, Theatre Wallay, US Embassy Islamabad on February 22, 2018 by Sarah Greenman.